Amy Ray was born today, April 12, in 1964. She is a singer-songwriter and member of the contemporary folk duo Indigo Girls. She also pursues a solo career and has released eight albums under her own name, and founded a record company, Daemon Records. Born in Decatur, Georgia, Ray met Emily Saliers when they both attended the same elementary school. They began performing together and recorded a demo in 1981. After graduation, Ray and Saliers went to different colleges with Ray attending Vanderbilt University. 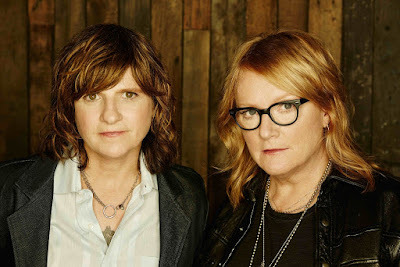 By 1985, both women had transferred to Emory University in Atlanta and formed the Indigo Girls. In 1986, Ray graduated from Emory with majors in English and Religion. In March 2001, Ray released her first solo album, Stag, a southern and punk rock album. The Butchies, a punk band whose members include Kaia Wilson, Melissa York, and Alison Martlew, provided support for five songs, and Joan Jett played on "Hey Castrator." In April 2005, Ray released the softer edged Prom, and in December 2006, she released Live from Knoxville. Her fourth solo album, the melodic Didn't It Feel Kinder, was released in August 2008. Lung of Love,which has more of an indie-rock sound, was released in 2012. Goodnight Tender was released in 2014 and The Tender Hour: Amy Ray Live from Seattle was released in 2015. Ray currently lives in the foothills of North Georgia. She and her partner, Carrie Schrader, have a daughter, Ozilline Graydon. In addition to the Indigo Girls and her work as a solo artist, Ray also runs an independent record label, Daemon Records, which she founded in 1990 and which is based in Decatur, Georgia. Some bands signed to Daemon include Girlyman, Magnapop, Nineteen Forty-Five, Michelle Malone, Three Finger Cowboy, Danielle Howle and the Tantrums, Gerard McHugh, New Mongrels, Grady Cousins, The Oblivious, Snow Machine, Utah Phillips and Rose Polenzani. In 1994, Daemon Records produced a folky recording of Jesus Christ Superstar: A Resurrection starring Ray as Jesus, Saliers as Mary Magdalene and Michael Lorant as Judas. Click here for a taste of that. Ray is also an activist involved in multiple political and social causes, including gay rights, low-power broadcasting, women's rights, indigenous struggles, gun control, environmental protection and the anti-death penalty movement among others. She has made several trips to Chiapas, Mexico to support the Zapatista Army of National Liberation. In 1993, she and Emily Saliers co-founded Honor the Earth with Winona LaDuke. Honor the Earth's mission is "to create awareness and support for Native [American] environmental issues and to develop needed financial and political resources for the survival of sustainable Native [American] communities. Honor the Earth develops these resources by using music, the arts, the media, and indigenous wisdom to ask people to recognize our joint dependency on the Earth and be a voice for those not heard." Follow Ray on Twitter (@AmyRay) or visit her Website at amy-ray.com.